MELBOURNE, Fla., July 24, 2017 /PRNewswire/ -- NXT-ID, Inc. (NASDAQ: NXTD) ("NXT-ID" or the "Company"), a security, authentication and payment technology company, issues an update following the recent WorldVentures™ BootCamp Miami event held Friday, July 21st, 2017 through Sunday, July 23rd, 2017. 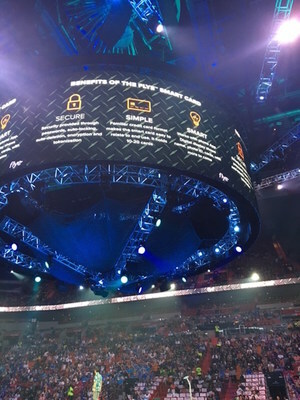 Several leaders from WorldVentures™ talked about the latest updates to the flye™ smart card, discussing its innovation in travel and payment technology to an audience of over 10,000 DreamTrips members. BootCamp Miami is one of WorldVentures™ events designed to provide members with its latest tools and resources. The flye™ smart card was presented as a "don't miss" opportunity; encouraging members to sign up for the next release of cards. The flye™ proprietary wireless smart card was created by NXT-ID for WorldVentures DreamTrips™ members. DreamTrips is a travel club and entertainment community where Members enjoy exciting excursions year-round to extraordinary destinations. WorldVentures currently has over 500,000 DreamTrips Members in 30 countries.